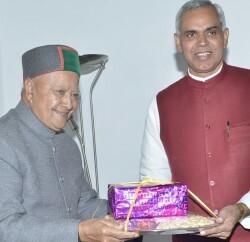 Dharamshala: Chief Minister Virbhadra Singh was given a warm welcome on his arrival at Dharamshala today on his five day visit to Kangra district. The Chief Minister was accompanied by Food and Civil Supplies Minister G.S. Bali & former Minister Chander Kumar. 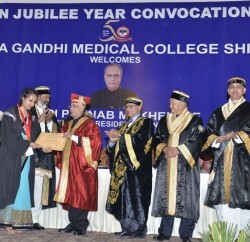 Jagdish Sipahiya, Chairman, Kangra Central Cooperative Bank, Kewal Singh Pathania, Vice Chairman, H.P. State Forest Development Corporation, Sanjay Rattan, Yadvinder Goma and Pawan Kajal, MLAs, C. Palrasu, Deputy Commissioner and local Congress leaders were present on the occasion. 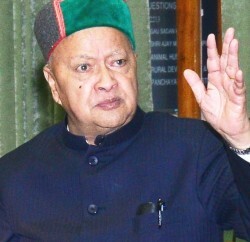 Later, Virbhadra Singh listened public grievances and directed the district administration to redress their grievances on priority.